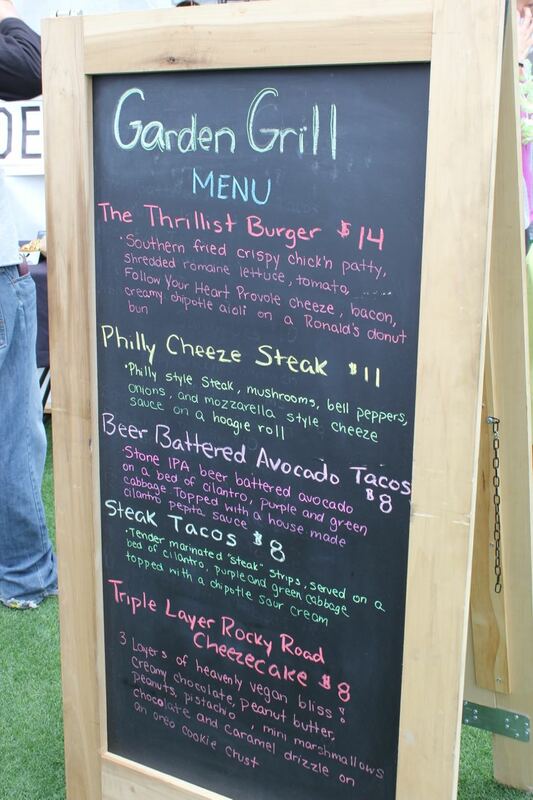 Garden Grill – COME TO LA!! My favorite vendor of the event and this has nothing to do with being the first thing this starving vegan gal ate for the day. They were serving up donut burgers they called the Thrillist Burger, but I called delicious. What is a donut burger, you say? 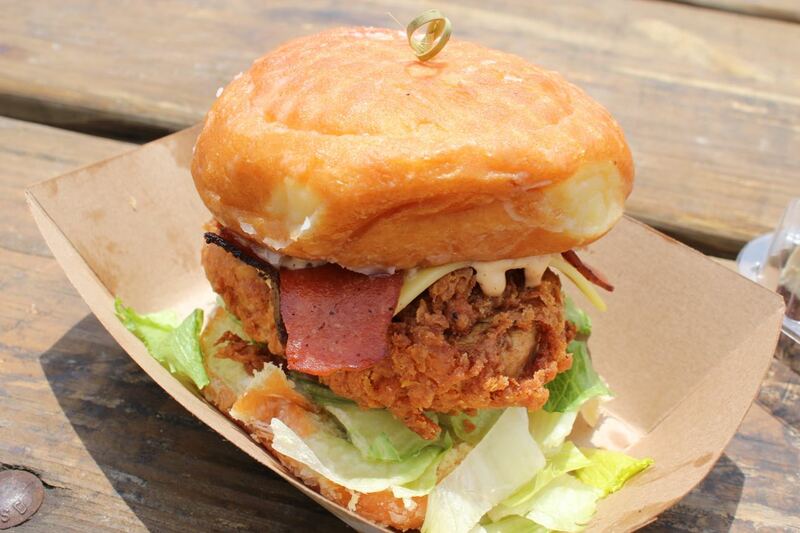 Fried chicken, bacon, cheese, sauce, tomato, and lettuce on a donut bun. Mind blown. And it gets even better, because the donuts came all the way from Las Vegas’ own Ronald’s Donuts. Sweet, salty, messy, huge – let me count the ways you amaze me. But wait! There’s more! 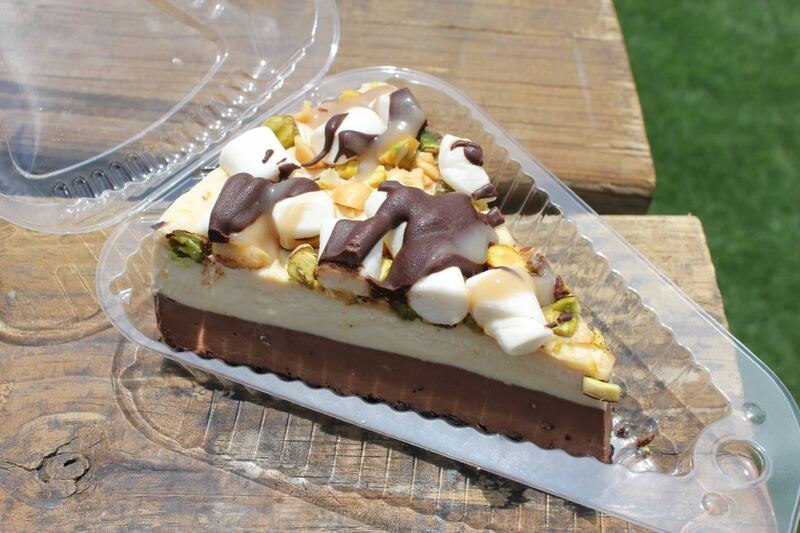 Garden Grill was also serving up Rocky Road Cheesecake. An oreo cookie crust with a layer of chocolate, a layer of peanut butter, a layer of marshmallows and nuts, and a layer of fairy dust and unicorns. I was seriously in a hypnotic trance after eating this. 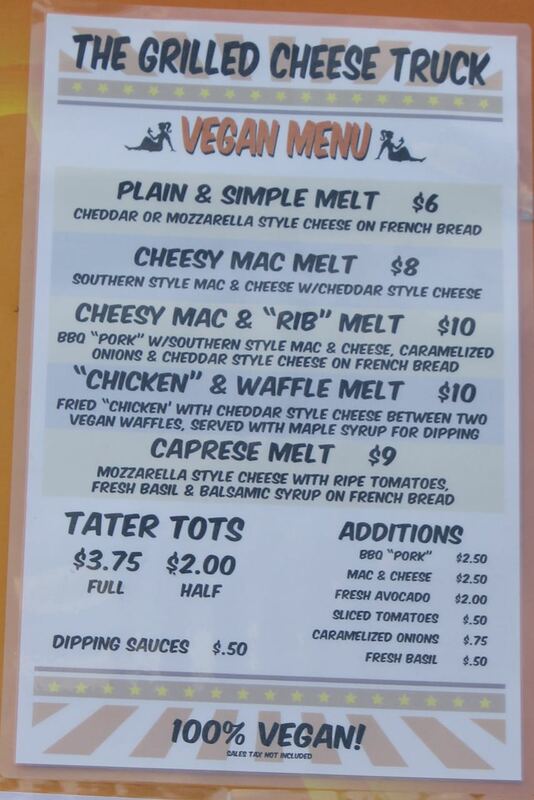 Next up on the list of things I absolutely needed to get in my mouth was the Mac n Yease at the Lusty Vegan booth. Chef Ayinde, the author of “The Lusty Vegan”, served up his famous dish. I had had this creation when I visited Hillside Quickie’s vegan cafe in Seattle (now closed) and have been craving it ever since. I was so sad when his kickstarter to open a vegan mac truck didn’t work out… or maybe it eventually did? 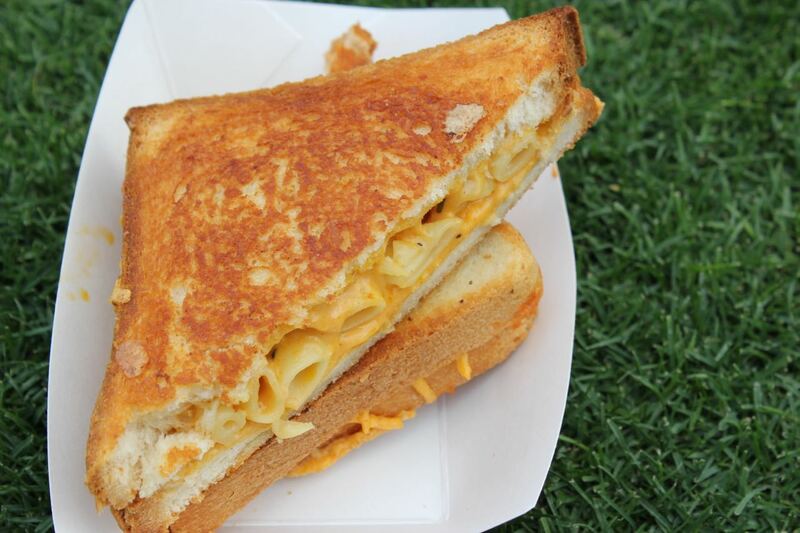 Please tell me there is a truck being retrofitted in some secret location ready to provide mac n yease to the masses! Speaking of mac – did you see the odd mating done over at Clara’s Cakes? 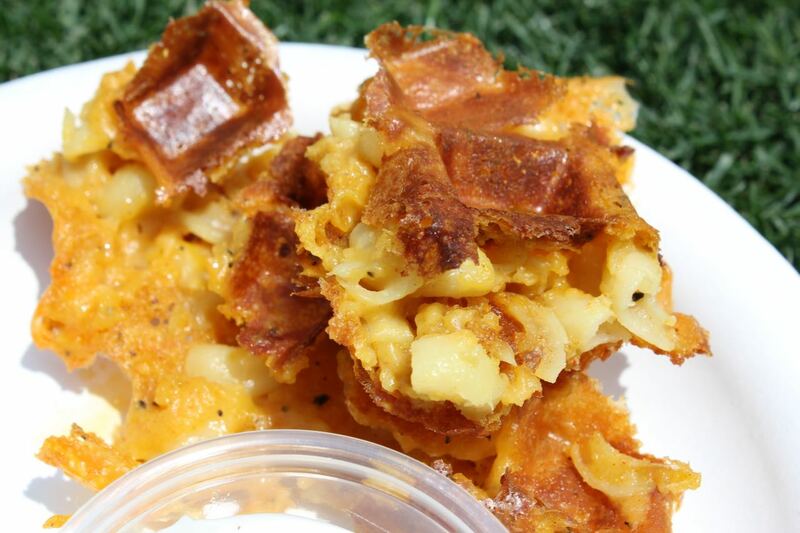 First off – the Mac and Cheese Waffle. 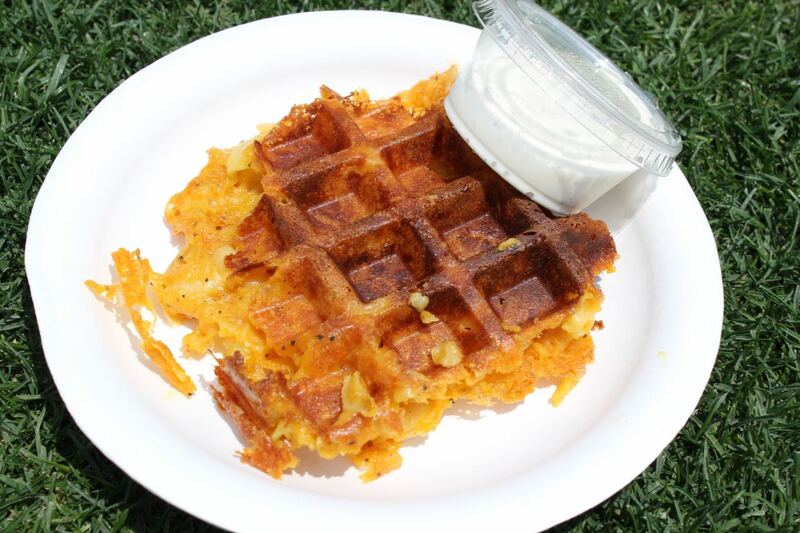 I mean mac and cheese + waffle = brilliant creation. The waffle was nice and toasty and was served with some Follow Your Heart Ranch. However, as much as this creation makes me want to cook everything in a waffle iron, I have to say that when eaten with the ranch it tasted mostly like ranch. And when eaten plain, it tasted mostly like crispy noodles. I guess you can’t add too much cheesy sauce or you’ll get a soggy waffle. The other crazy thing happening there was the Inception Cookie Cupcake. If you’ve seen the movie, you’ll get why the name in a second. Take an oreo cookie and wrap it with chocolate chip cookie dough then stuff it into a chocolate cupcake and top with frosting and a fantasy about Leo circa “Romeo and Juliet”. 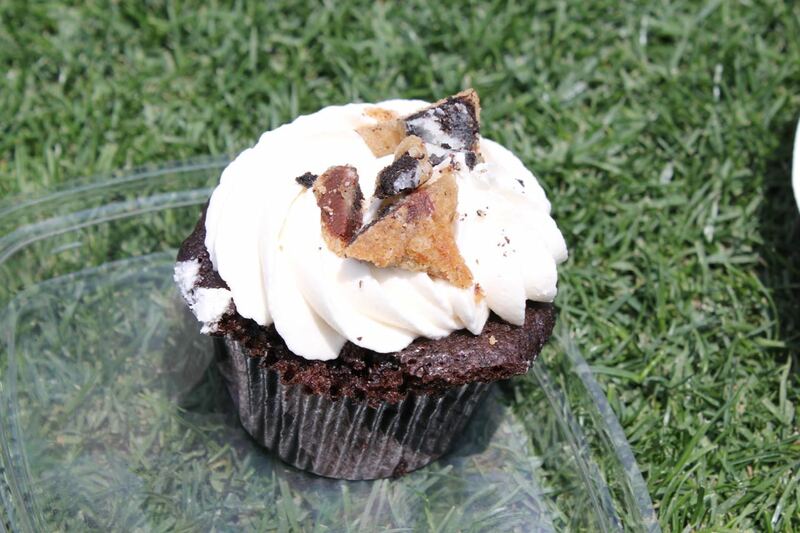 This is the Inception Cookie Cupcake. Because the cookie was so giant, it mostly tasted like cookie and not so much cupcake – but I still felt like I was getting two for the price of one. Hold up – I still wasn’t done talking about mac and cheese. Rabbit Hole was also creating a “healthier” version of this classic. Now, before I start, let me first say that I was fully prepared to bash their King Mac. I mean, I had one bite of it and was thoroughly upset. 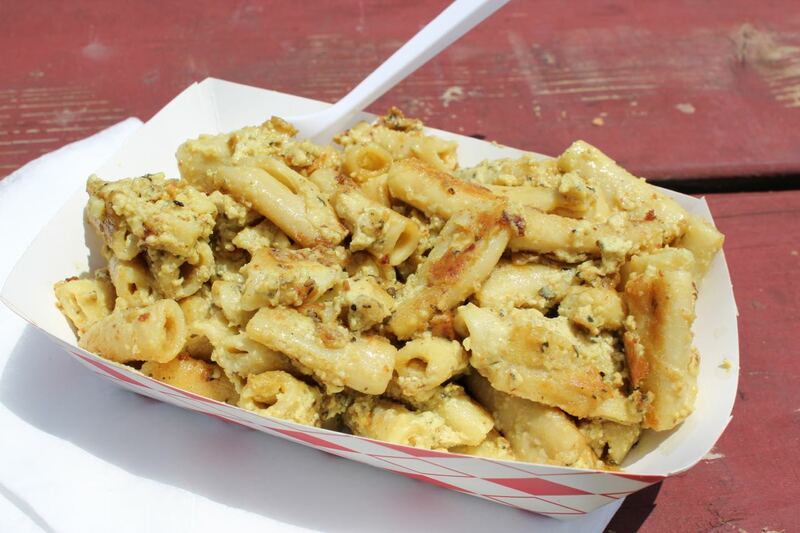 They were terrific with their shepherd’s pie at Vegan Street Fair, but this mac and cheese thing at beer fest was a miss. The noodles didn’t taste fully cooked and my friend even went so far as to forced her husband to angrily throw their mostly uneaten King Mac in the trash to protest the nastiness. But then something completely unexpected happened. Even though I disliked the dish at beer fest, I dutifully placed the leftovers in my tubberware. The next day I thought, “What the heck? I’ll heat it up and eat it. I don’t like wasting food.” And you know what? It actually was very tasty. I guess the noodles soaked up more liquid, because they became softer and the flavors marinated together more. I take back what I thought before. Their King Mac was rather good. 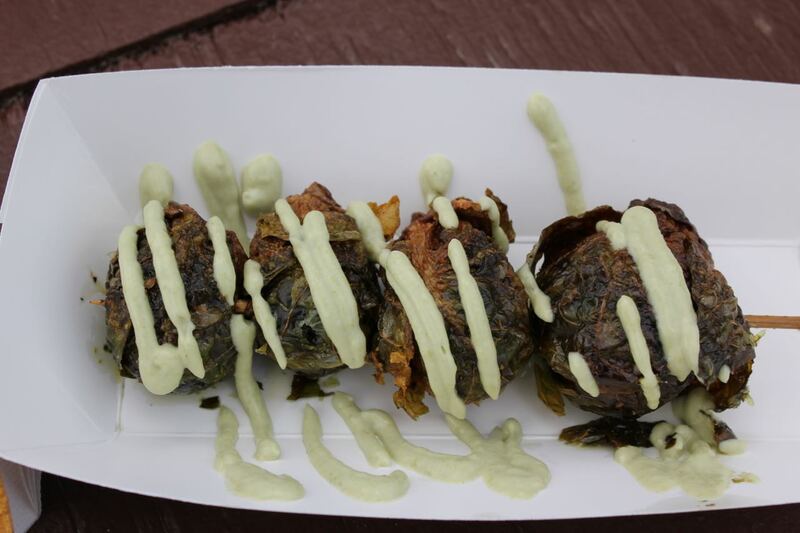 They also served up Fried Brussel Sprouts – which were delightful and (compared to everything else I had eaten so far) made me feel like I was “eating clean”. Now, let’s take a moment to reflect on all that is right with the world. Donuts. Doughnuts. However you spell it, that sweet, fried, Homer Simpson staple has delighted hordes of fans for over a century. Pepples Donuts came all the way down from San Francisco with their take on the classic cake donut. Offering over a dozen flavors, I had the willpower to only select three (but really I wanted one of each). 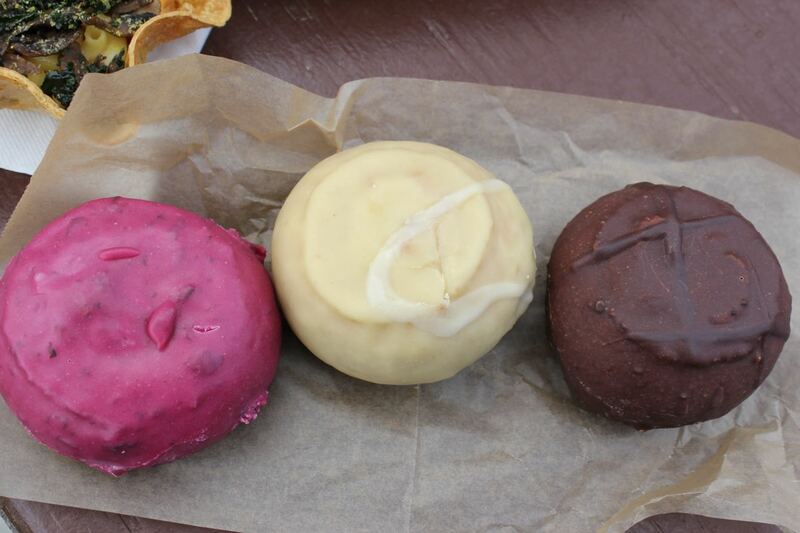 Blueberry (perfectly moist), Orange Cream (refreshingly citrusy), and Chocolate (the most decadent) were my flavors of choice. I think blueberry might have been the favorite, but that’s kind of like asking one’s favorite child. 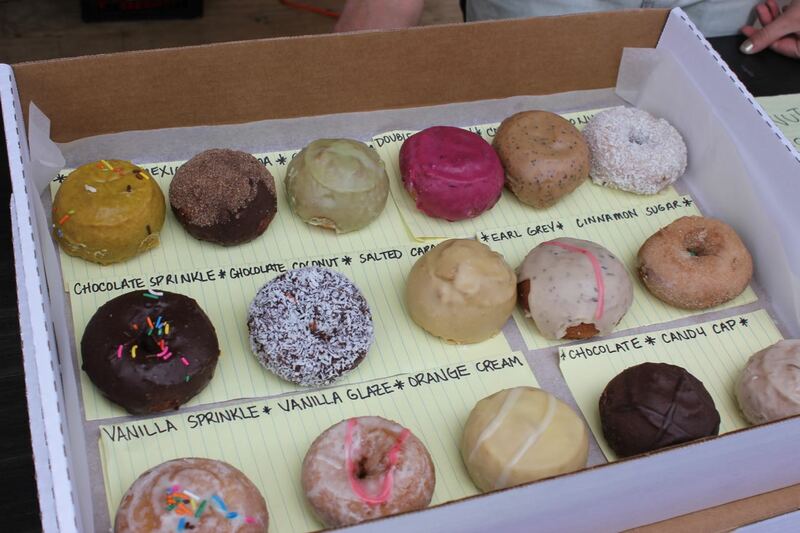 Cake donuts… I know. 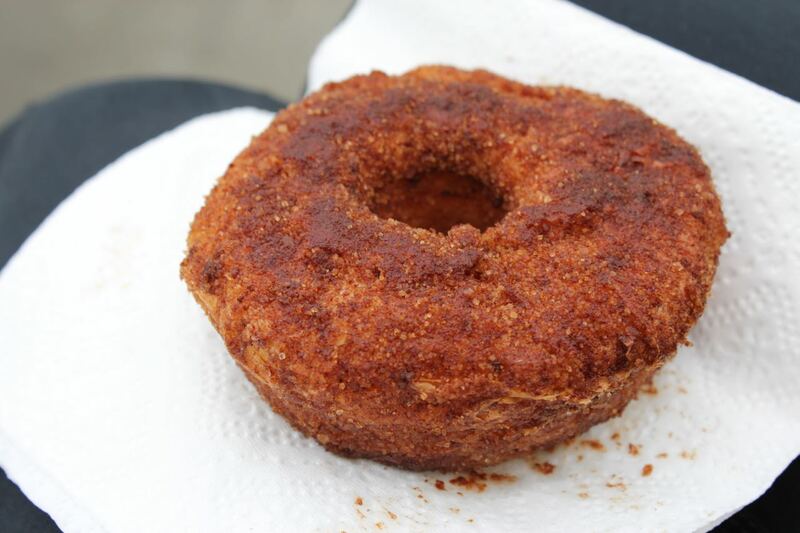 People aren’t too keen on trying the non-yeasted variety, but (trust me) these are on my list of top 10 vegan donuts from around the world (or at least of the many I’ve tried). My brilliant vegan guy even telepathically knew to bring me back some after a recent trip to the Bay Area. Did I mention mac and cheese yet? Because this is sure looking like a festival for the yellow noodle. Might I mention just one more? 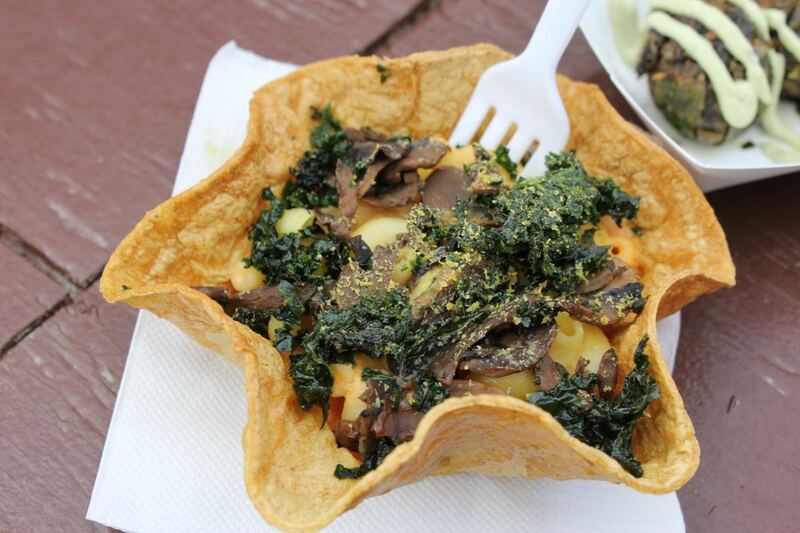 The Grilled Cheese Truck does it right – but only when they are serving their vegan menu. All other times they serve the animal laden grossness and just get it wrong. I wish they were vegan all day- every day. The Cheesy Mac Melt is made with Daiya. I don’t have a problem with Daiya in its original form, but somehow The Grilled Cheese Truck makes it taste even better. I guess anything tastes better on an oiled down piece of bread. 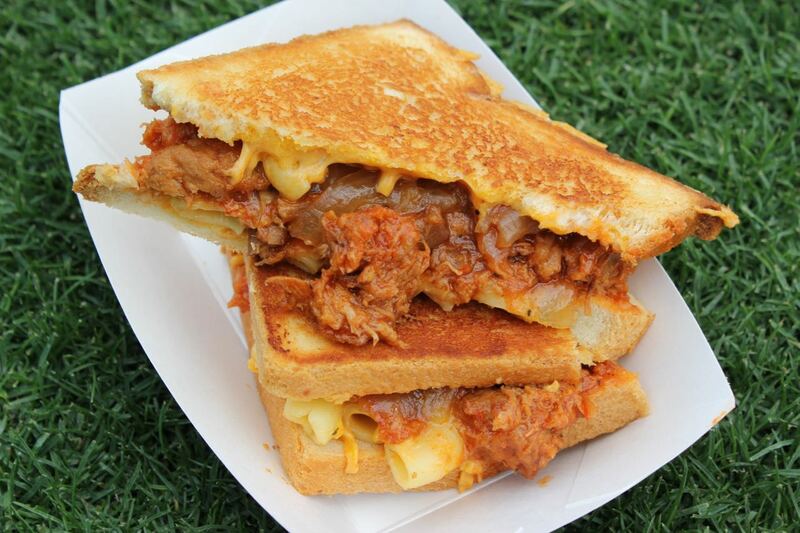 The Cheesy Mac and Rib Melt is like the first sandwich only with the addition of BBQ “pork” (I think it’s jackfruit). Is this legal? So good. It’s the sweeter kind of BBQ, but I think I remember seeing hot sauce there for those who wanted some kick. Gotta do a shout-out to the fine people at Gardein. 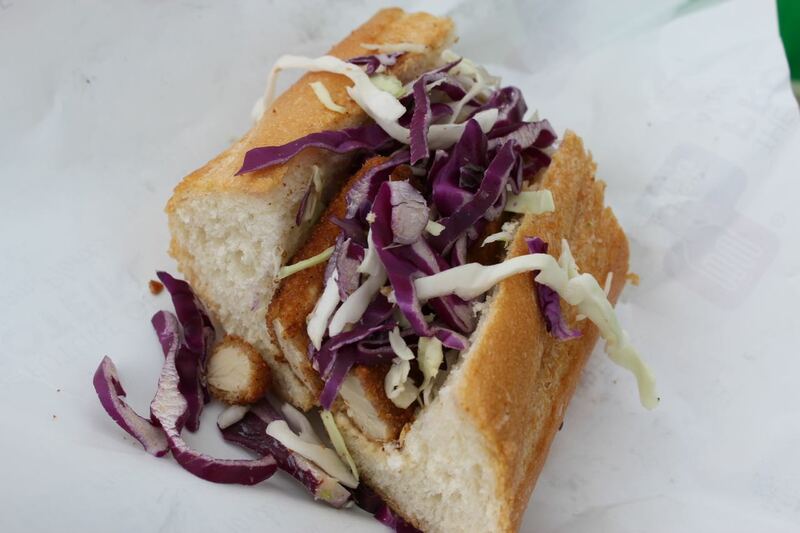 They were handing out free Po Boy Sandwiches. After all the mac and cheese, it was nice to have a simple (but tasty) bite of something. Also serving up something free was the Follow Your Heart booth (not pictured). They were handing out samples of vegan cheeseburgers highlighting their new sliced cheeses and some product coupons. I love Follow Your Heart cheese, vegenaise, cafe, philosophy…. I think at this point my stomach might explode and they’ll have to call an ambulance. I try not to think of the starving children of the world as I bite into the Cronut from the Ridiculous Baking Co. After all, the amount of food I’ve consumed thus far is kinda ridiculous. The texture was really good, but I found the cinnamon to be too over-powering. I really did take a lot of this stuff home to eat later. In fact, I got a few meals out of this event thanks to the invention of air-tight containers. However, I couldn’t take anything home from Divine Dips. As much as I’d like to, I think it would have melted from Pasadena to the westside. I’ve always wanted to try their ice cream sandwiches. 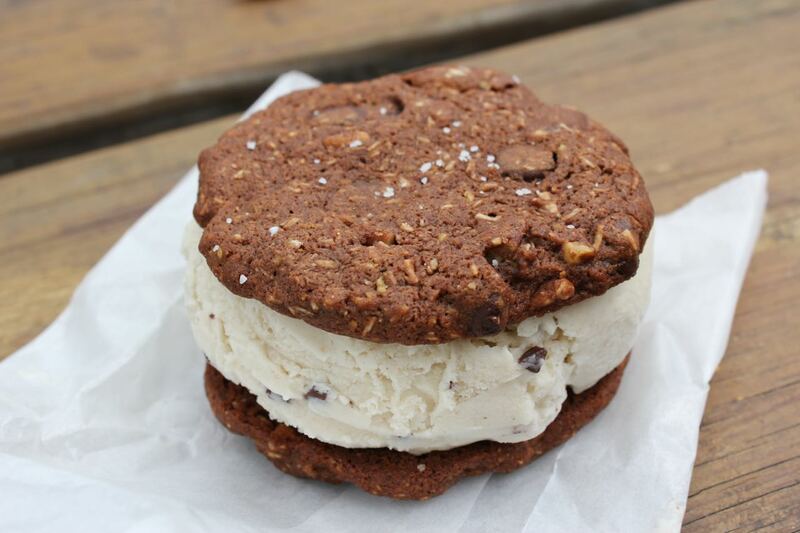 I got the Mint Chip – Chocolate Cookie Sandwich, because the other option was a salted chocolate chip cookie. I love chocolate chip cookies, but I hate this new craze where they put salt on all things sweet. Don’t get me wrong, I like sweet and salty (see Thrillist Burger above), but raw salt on my sweets is a no-no. That’s what ended up being on my chocolate cookie (no mention of this in the description when I ordered it). I ended up just licking out the ice cream – a refreshing treat for (almost) the end of my day. After talking with some friends, I decided to get one more item from Divine Dips (their ice cream is so good!). 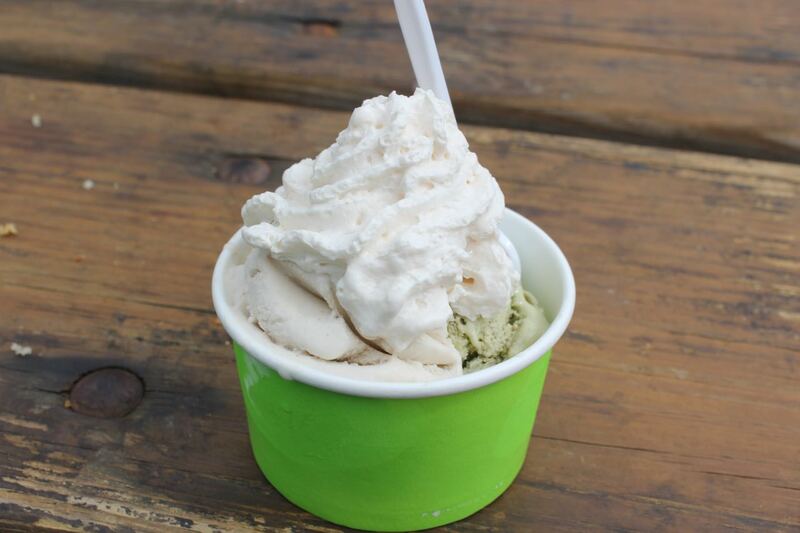 I got the Madagascar Vanilla Bean and Green Tea Ice Cream topped with Whipped Cream to finish off the event before I went home to curl up in fetal position and curse the deliciousness that being vegan brings. When I left, the lines had gotten longer and I heard of things selling out. I could see if people had arrived later, they might not have had the same great experience that I did, but I haven’t really heard any complaints. 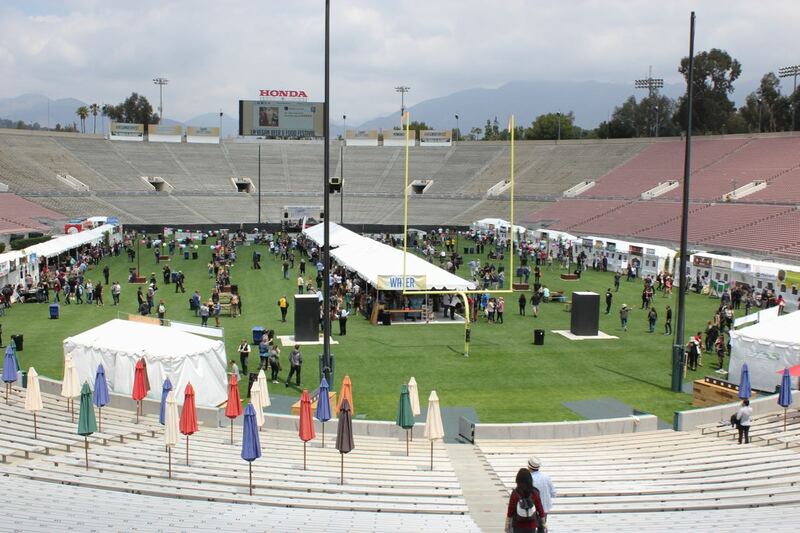 My one complaint – and it’s not really a complaint as more of an observation – was that most of the vendors and all of the beer was inside the stadium. However, there were about 6 vendors stuck outside the stadium near the entrance and I felt really badly for them, because no one was patronizing them. I don’t know what happened there, but I hope next year everyone is able to be in the same place. 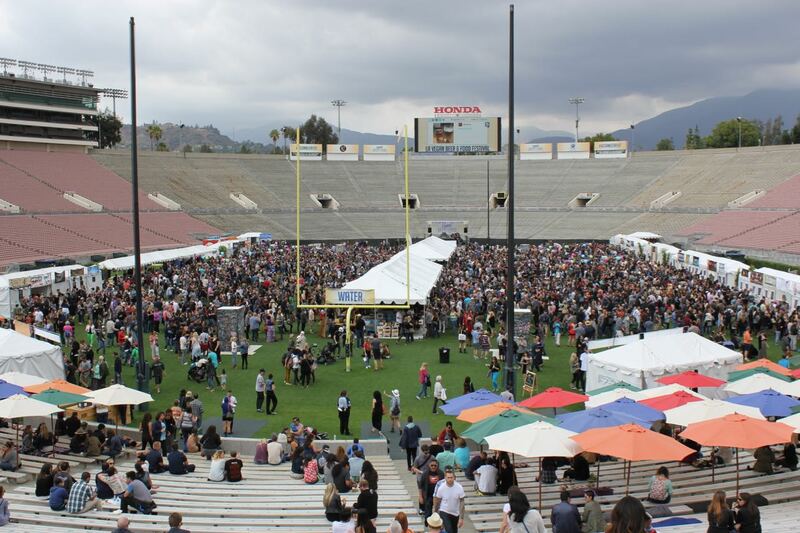 Until next time – LA Vegan Beer Fest.